Carrie Lane coached for more than 15 years in the NCAA system, with stints at Eastern Illinois University, Coastal Carolina University, University of Virginia, and the University of Nebraska. Currently she coaches the throwing events at the University of Wyoming. She is a former collegiate distance runner and became a throws coach shortly into her professional career. Just prior to her role at Wyoming she worked for two years as an athletic development coach with high school and post-collegiate track and field athletes, assisting with speed mechanics, weight training, and technical event coaching. While still in the collegiate ranks she was twice recognized as USTFCCCA Regional Assistant Coach of the Year and also recognized as the National Assistant Coach of the Year for Women’s Throws in 2004. She coached her throwers to 23 NCAA First Team All-American honors, 4 Big Ten championships, and 9 ACC championships. 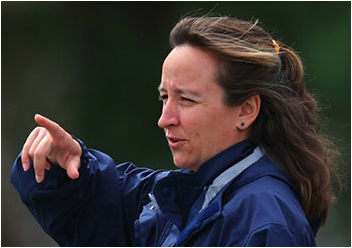 Carrie was a USA National Team coach for three IAAF Track and Field World Championships teams. She was the college coach for Olympic hammer thrower and US champion Amber Campbell and, from 2006-09, was the personal coach for Olympic gold medalist shot putter, Adam Nelson. Carrie coached Adam to a silver medal in the 2007 IAAF World Championships, and to the farthest throw in the world in 2008. She also coached Chad Wright, the NCAA Champion in the men’s discus in 2012 and a 2015 World Championships participant. She is also an instructor for the USTFCCCA Track and Field Academy, where she teaches other coaches about periodized training program design, weight training, biomechanics, and event-specific technique.